Discuss the role of silver in linking the economies of Asia, the America's and Europe during the sixteenth and seventeenth centuries. Up until the fourteenth century the four main commodities traded globally where gold, silver, copper and shells, however in the early part of the sixteenth century silver became the dominant medium of change with China introducing it as its main form of currency. As a result of this, for the first time China needed to engage in trade outside that of its neighbouring states. Spain at this time was becoming an increasingly powerful empire not only as a result of its expansion within Europe but also as it continued to increase its empire over sea's, with the founding of Manila in 1571 allowing for the first time direct trade between China and the America's. Historians have examined what impact the evolution of the global silver market had upon linking the economies of Asia, the America's and Europe and whether it was in fact partly due to silver that the early modern world became for the first time interconnected. If it is assumed therefore that silver did in fact link the economies of Asia, the America's and Europe historians can also examine the repercussions that this had on individual economies and societies positive and negative, and whether 'the legacies of global economic linkages that emerged by the end of the 16th century are visible today'. Spain in the sixteenth and seventeenth century encountered what has been referred to by historians as a 'Golden Age'. Spain’s success in this period saw it build the foundations for an empire that in the coming century would develop to be arguably one of the greatest powers not just in Europe but in the world, having built up its empire in ‘the Mediterranean, central and north western Europe, The western Atlantic and southern pacific’.The historians Barbara and Stanley Stein argue Spains greatness in this period was largely due to Spain’s reliance on the silver and gold pines in Peru. The first connection between the America's and East Asia came as a result of Spain's ambitions to reach the West Indies. Chance therefore played a significant role in Columbus discovering America in 1492 and in doing so a realisation that a route to Asia had been found without going through the Atlantic. The historian Luke Clossey here notes that 'Francos Xaviar himself has warned the Spanish court against the transpacific route, because of the hazards of the voyage'. This quote illiterates the enthusiasm that the Spanish held for finding a sea route to Asia, as it displays that Spain obviously felt the dangerous of reaching Asia were outweighed by the riches Asia held. Initially the Spanish Conquistadors took wealth from America by looting from the great riches of the Aztecs and Inca. However, the way the New World’s economy was being run changed after the Spanish discovered silver mines of Potosí in 1545. Historians are able to see the vast amounts of production that went on in the area of Potosi by examining estimations of the populations. In 1545 it is estimated that the population of Potosi was 3000, only two years later this had shot up to a remarkable 14,000 and by 1650 was estimated at 160,000. Although therefore Spain discovered the America's in the early party of the fifteenth century, it was not until 1571 when Spain founded the city of Manila and for the first time that a pacific trading base was established. Flynn describes this point in history as being the moment when 'global trade [was] born' , illustrating the importance that continuous trade across the Atlantic ocean would have. The importance though of a pacific trading base is only understandable when examining the global economic climate that existed at that time. By evaluating China's importance in the middle of the sixteenth century we can examine how silver became the driving force behind a global trade network in this period. At the beginning of the sixteenth century the governor of the Philippines commenting on the Chinese explained that 'Their god is silver and whatever way they can get it is their religion'. This source illustrates China’s reliance on silver and as a result their vulnerability as a shortage of silver could lead to its economy collapsing. China had previously little need to trade beyond its neighbouring states due to the fact that it had all of its resources close by. Europe on the other hand was desperate to engage in trade with Europe as its goods such as silk and porcelain fetched high prices in Europe. The ‘Silverization’ of the Chinese economy therefore gave Europe an opportunity to engage in trade with China. Although it is clear Europe, Asia and America became interconnected in this period, it can be hard for historians to estimate the exact amount of silver exported to China in this period although recent 'estimates indicate that New Spain’s Silver production from 1725 to 1810 grew at the rate of 1.2 percent annually'. This statistic although perhaps accurately indicating an increase in growth of silver production does not give an accurate figure of silver flows in the period, this is especially hard when historians consider the idea that there was illegal smuggling of goods by privateers and pirates, which can distort figures. A letter from the Ecclesiastical Cabido to Felipe IV claimed that 'illegal smuggling made up five-sixths of total' amount of silver production from the New World. Although this figure may be an estimate it does illustrate to historians the complexity of estimating silver production in the sixteenth and seventeenth century. This though does not mean that all of China's silver was sourced from the west. Fylnn and Giraldez put forward the argument that 'historical evidence forces us to reject the conventional depiction of early modern monetary flows in East-West terms'. China looked to Japan for a vast majority of its silver from 1436 to 1540. It was only once the demand for silver in China had exceeded Japan's supply that substantial trade began between China and Europe. However Japan became a major extorter of gold and copper in the last part of the seventeenth century, thus as the historians Flynn and Giraldez reinforce it is dangerous to make broad statements about intercontinental flows of monetary substances. This is illustrated when historians consider the impact the amount of goods coming from China had upon Spain’s textile economy. Spanish silk producers realised they were losing a substantial amount of trade due to cheaper Chinese silk imports, which resulted in 1582 with trade between Manila and Peru being banned by the Spanish monarchy. Although the global trading network positively linked Europe and China in the sixteenth and seventeenth centuries, with both receiving profit in exchange for their goods there where negative aspects of the global trade network, not seen in previous centuries with the most serious being disease. The Spanish conquistadors bought with them to the America’s diseases, that swept through the New World at a rapid pace with the destruction caused having been described as ‘rivalling the black death’,  and in some places wiping out up to ninety percent of the population. As well as disease, slavery played a huge role in allowing the silver trade to even function. Spain in this period made vast amounts of profit due to its use of free labour. It has been estimated that approximately eight million local and African slaves died from not only from harsh working conditions but from mercury poisoning within the mines of Potosi. Historians should be aware of the more sinister undertone that lies at the birth of global trade, as silver can here be seen as something that pushed communities apart as well as together. The idea of a globalised world this early is relatively new among historians, as globalisation or in this case a global trade network is often periodized as being a later phenomenon .The sixteenth century though does mark the beginning of a trade network where Asia, America and Europe where linked for the first time, Flynn and Giraldez's put forward the idea that 'the entire world economy was entangled in a global silver web. Here the word ‘entangled’ displays the many different and complex aspects of the global trade network, and how it affected everyone involved from their diet to their currency. By examining the way a global trade network was created in the sixteenth and seventeenth century’s historians today can highlight the problems that occurred and compare these with the problems still seen in our more complex and globalised economy today. 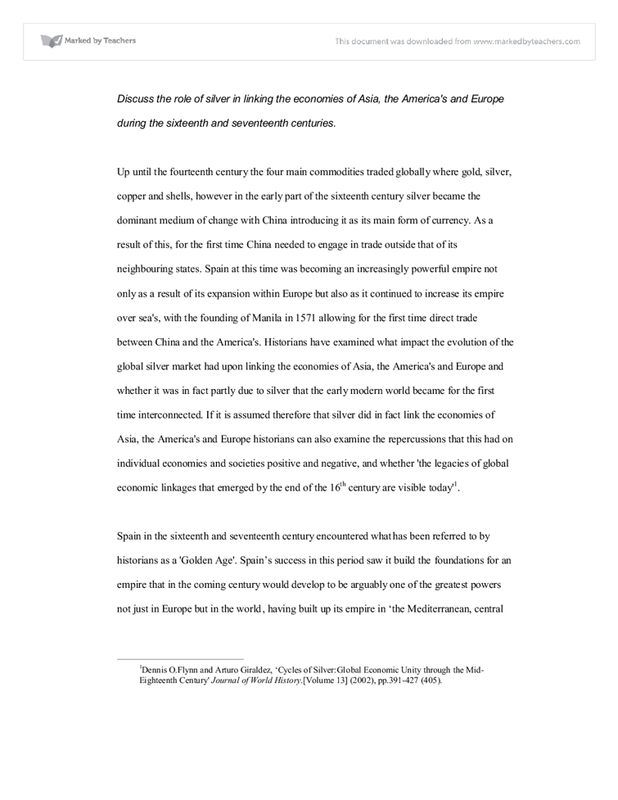 Dennis O.Flynn and Arturo Giraldez, ‘Cycles of Silver:Global Economic Unity through the Mid-Eighteenth Century' Journal of World History. [Volume 13] (2002), pp.391-427 (405). This student written piece of work is one of many that can be found in our University Degree 1700-1799 section. Why do Historians tend to disagree so much? She's broken my rules. She's committed a felony." Although this book is a twentieth century insight into slavery and is only loosely based on facts, it demonstrates the way in which the early treatment of slaves was harsh and often uncompromising. The same could be applied to other races of nomadic peoples, such as the Saami or the Irish in Europe. 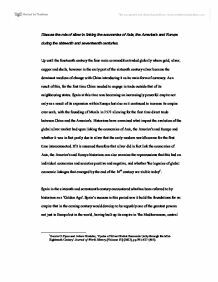 The lack of a formal, settled, abode was seen as a lack of any civil quality, therefore necessitating a greater power to step in and bring the heathens into line with the cultured world. This is essentially the crux of the debate. Until the nineteen fifties, there was no debate. The enduring view was that NSW was colonised because of the crisis convict situation in Britain. Convicts were sent to America between seventeen eighteen and seventeen seventy-six. The heir to the Russian thrown, Tsaravich Alexei, tragically suffered from haemophilia4, an incurable disease and the cause of great anxiety to his parents, especially Alexandra who blamed herself she would go to any lengths to ensure her son's safety. it has been seen, that the benefit of these financial networks was to serve as a basis for expansion of industrialisation through the accumulation of capital in Britain that could drive these projects forward and that the desire for consumer items motivated the workforce.